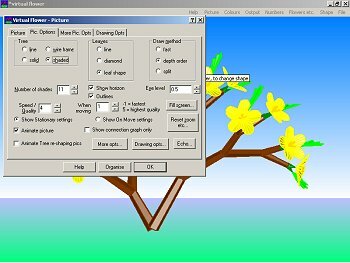 The program for creating of 3D plants (and other things) has name Virtual Flower. You can download it from here - just click there to the Try it button#1 (you can find the link on our download page as well - on this page we update the link if necessary). Free version which you can get there has some limitations, but for our work is now OK.
After downloading of the program you have to install it. And then - let's start our work. At the beginning you will get the standard tree in the main window of the program. You can return to it everytime when you choose the item File/Reset from the main menu. If you press the left mouse button in the window and move with the mouse then the tree rotates. If you use the right button instead then the camera moves. More sophisticated functions you can use through the menu. We recommend you to use last item from every part of menu (Tabbed) - it contains all the previous items. When you want to influence how the picture looks like, the best point to begin is in the menu Picture/Tabbed. Choose Pic. Options and select how the trunk should look like, and the same for leaves and horizon. Just after any click you can see the changes on the screen - it's good for your experiments. Now you can choose More Pic. Opts and select not to show the picture in the 'normal' way, but as an anaglyph. Check the boxes custom and red/cyan, we recommend to check tree frame/box as well - the frame makes the sense of a perspective better. Set Screen dist. and Eye separation to the values which are the best for you - take your 3D glasses and try it. For us - when we created simple trees - were acceptable values 4 and 0.07. Don't miss the option Stereoscopic pair - we will use it later - and Normal - choose it just now. This mode is the best for image editing. Maybe you aren't very happy now, because you've seen the software can do only black and white anaglyphs. Don't worry - we will show you how to easily create color ones as well. In the bookmark Drawing Opts don't miss the value of timeout - when the drawing takes too long the program stops it's work and shows an error message. If you don't like this behaviour, set the value of timeout long enough. It's easy to set colors of your plants. Just choose the menu Colors/Tabbed. Then click to the color you want to change and on the color circle - and on the color stripe - choose the new one. If the window with color circle doesn't appear - and you can see only it's header instead - just move it's bottom edge to 'open' it. It's not necessary to confirm the new color - just close the window. And we can create our own trees. Use the menu Flowers etc./Tabbed. First bookmark allows you to change the shape of leaves. You can choose one from the list or modify a selected leaf - just shift the points on the edge of leaf. Now select the appropriate size of your leaves. All the changes you can see on the final picture on your screen. When you use the button Add to (or the bookmark with the same name) you can add leaves, flat flowers (Sheet flowers) and 3D flowers (3D flowers) to selected groups of branches (just try to click to any of the strips there). Then you can change features of the flowers - in the appropriate bookmarks. On the bookmark Objects you can select some objects, which replace the flowers. In this way you can put to the branches for example cubes. To change the shape of flowers use the bookmark Petal. The shape of the tree you can change with the menu Numbers/Tabbed. If you change the value Branches then there will be another count of branches rosing from every knee. With Stalks you change the amount of leaves (and stalks, sure). The numbers in all the rows mean for example the rotation of every leaf on a branche (for example the second number means the second leaf). The best way to see the impact of changes of these values is to try. In the Numbers B menu you can change more parameters - the lengths of the branches (Lenghts of branches) and scaling of branches (Scale at each step). Some of the changes you did in the last two items of menu you can do in the menu Shape/Tabbed. Some of them you can do with a mouse - which is very pleasant. It's possible to create not only trees in this software. Try for example to give strange shapes to the branches and then choose Shape/Branches/Branche shapes - none. The branches will disappear and shapes will remain. And you can try to animate your tree as well. If you want to create a moving image, use the menu Output/Animations. Choose Trees grow or Leaves grow and you can see how the tree or the leaves grow. Don't forget to switch Animate main Win. and shape tree on. In the Cycle time box you can set how long (in seconds) should the animation take. Good inspiration for your own images offer files added to the program. Just use File/Open and open a predefined picture. After this step load the pictures to the 3DJournal software and make 3D picture. If the 3D picture isn't good (and the black and white one is), try to lower the intensity of colors in the graphic editor or in the 3DJournal software. Not to black and white, but... Believe us, it can really help.